These spicy marinated prawns are sure to be a hit with your next party or dinner guests! In a bowl, whisk oil and Baxters Sweet Chilli Relish. Pour over prawns and mix well. Cover and refrigerate for at least 6 hours. Preheat a pan or cook on BBQ. When hot, add prawns, cooking 2-3 minutes per side. Place on a platter for finger food serving at a party or serve with grilled cos and crusty bread for a light dinner. Yum! 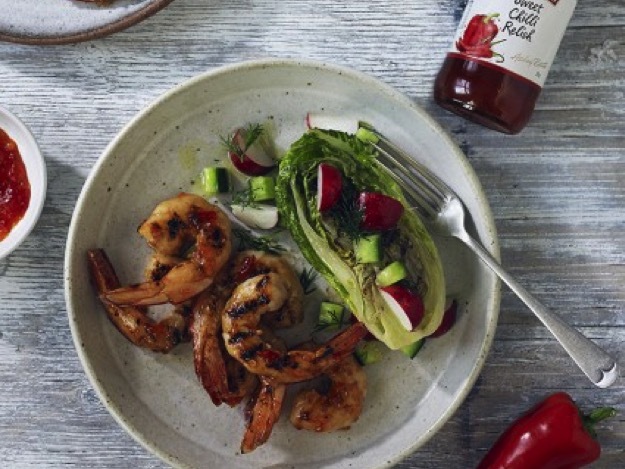 Can you get Baxters sweet chilli relish in Cole or Woolies? How delicious and simple – when is the party? Oh! This could be something for my hubby who loves spicy food!! Ooh sounds delish. Was a bit nervous at how spicy, but figure the sweet chilli relish will tone things down a bit. Yum. Mmmm. Definitely will be trying such an easy marinade. Thanks. Those prawns look so succulent! Ooh these sound very yummy, thanks. Delicious and perfect for entertaining; thanks. Yum. This will be entree for my next dinner get together! I would have never thought to use relish as a marinade but it works really well! A great lunch idea for the Christmas holidays. quick and simple yet looks delicious. Prawns are a real treat.